These Wilson Jones 1" Yellow PRESSTEX Ring Binders offer coated pressboard binders for the ultimate moisture resistance to protect your important documents. These Wilson Jones PRESSTEX Ring Binders are extremely durable and designed to retain moisture to protect your papers. These 1" Yellow PRESSTEX binders are equipped with round rings with double boosters for easy opening, made of 19% recycled materials, and coated pressboard for moisture resistance. Protect your documents from the elements today with these Wilson Jones 1" Yellow PRESSTEX Ring Binders Product number A7038610-C. Welcome to MyBinding Video. 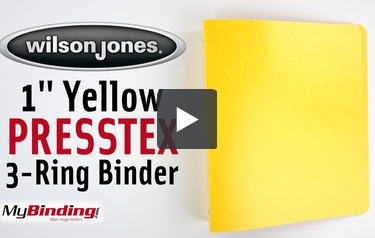 These are the 1” Yellow PRESSTEX 3-Ring Binders from Wilson Jones. These binders are some of the most durable you can find, especially in moisture resistance. Wilson Jones’s Presstex is high quality coated pressboard that is non-absorbent and forces liquids to roll right off the cover. The bright yellow color helps the binder to stand out, and can be used with different colors for coordination. Presstex is very flexible as well, allowing the covers to bend without damage. The 1” round rings can hold up to 175 sheets of paper and dual triggers make opening easier. These binders are sold individually. For more videos and all your binding needs, visit MyBinding.com.